Autumn is the prime time for eating potatoes. They’re a good crop for the novice gardener as they’re such a user-friendly vegetable. I got a good yield this year from the tyre stacks; the harvest has kept me supplied since August! Pick out the blemished or nibbled spuds and eat them first, keeping the good ones in a cool dark place for later. I always cook more than I need for one meal and use the leftovers next day. 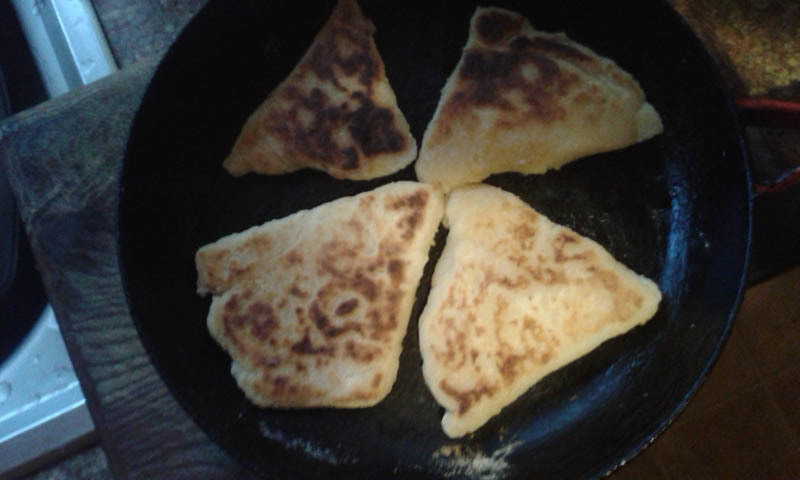 Twice baked potatoes, shepherd’s pie or fried potato cakes are my usual recipes of choice, but I thought I’d give potato scones a whirl this time. You need a griddle to cook them on. This is a thick, flat metal sheet, about the size of a frying pan. It’s a useful piece of kit; people often used griddles to make pan breads over an open fire when we were living off-grid at long events. You can use them on a gas cooker, but I haven’t tried with an electric ring. Experiment; I expect it’ll work. I haven’t got a griddle, so I used the heavy Le Creuset frying pan which is so perfect for pancakes; that worked just fine! Although their kit is fiendishly expensive, I’ve used this pan constantly for twenty years and it’s probably good for the same again. This recipe is for eight ounces of mashed potatoes. Weigh your leftovers and adjust the amounts accordingly. Don’t mash butter in if you plan to make these; serve them for the initial meal with the butter dotted on top, or the quantities will be wrong. Mix the flour and salt into the mash. Rub in the butter to make a stiff dough. It might seem a bit dry at first, but will soon soften as the butter warms up, so don’t add liquid. Knead this lightly, roll it out to about a centimetre thick on a well-floured board. 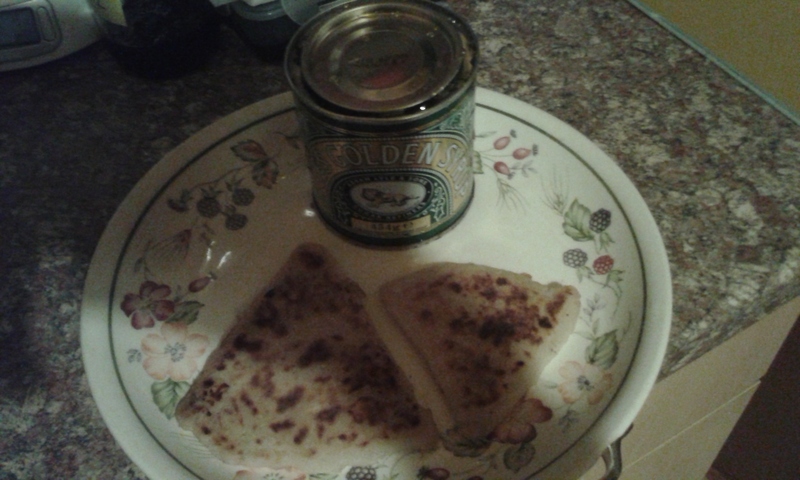 Cut into triangles and cook for five minutes each side on a hot greased griddle or suitable equivalent. I’d eat these with beans and bacon, but the kids from the Gardening Group preferred to spread them with golden syrup – this was surprisingly tasty, if rather sticky! This recipe made eight scones at a total cost of thirty pence, using organic locally sourced butter and flour. Read the Food section of ‘The Resilience Handbook – How to survive in the 21st century’ to get started on low cost living! I eat from stores, supplemented with my own produce – it’s not even a big garden, nor does it take much effort. I only venture into supermarkets to stock up on heavy stuff and bargains; I feel almost deprived of retail experience! However, I’m off to explore Iceland next week thanks to the money I’ve saved, so I can live with it!